There are several ways of worship. Many times we can worship with easy words, kirtan and some time we use hymn. Hymn is very effective because it immediately concentrate our mind and gives early results. Every hymn creates different impact and energy. Why We Need Rosary for Praying with Mantra? - Astro Upay मंत्रों के उच्चारण में क्यों जरूरी है माला? Therefore, people use different rosary for different hymn. One gets energy of different hymn. It is also used to avoid error in counting. The balls in the rosary called as Manaka. Usually, rosary contains 108 manaka but sometime it has 27 or 54 manaka. The numbers of manaka should be at least 27 or 108. There should be a knot after manaka. Do not touch your index finger while worshiping. Do not violate Sumeru as well. Keep rosary in cloth or Gaumukhi while chanting hymn. Keep rosary in your hand and worship before chanting hymn. It gives good result. Rosary should be personal and never wear it if you chant hymn with it. 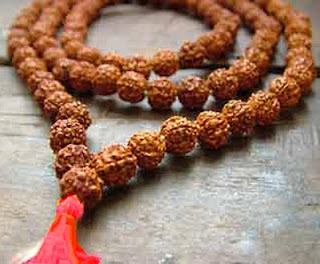 Rudraksh: One can chant any hymn with rudraksh rosary. You can get special benefits by chanting lord Shiva and his family members hymn with rudraksh rosary. One should chant “Mahamrutanjay” and “Laghumrutanjay” hymn on rudraksh rosary. Crystal: It is considered for concentration, prosperity and peace. One should chant goddess Saraswati and Lakshmi hymn with this rosary. It is also beneficial to wear crystal rosary to get money and increase concentration level. Turmeric: It is used for special usage and wishes. Turmeric rosary is used for Jupiter and goddess Bagalamukhi hymn. One can also use it for knowledge and progeny. Sandalwood: There are two types of sandal rosary. One is red sandalwood and other is white sandalwood. It is beneficial to chant Devi’s hymn with red sandalwood rosary. It is beneficial to chant lord Krishna’s hymn with white sandalwood rosary. Tulsi: It has special importance in Vaishnav rituals. It is believed that lord Vishnu and his incarnation’s hymn should be chant with this rosary. It is necessary to rearing Vaishnav ritual if you wear it. Never chant lord Shiva’s hymn with Tulsi rosary. Remedy: Never use reverse Swastik. It increases mental disorders and your progress will decrease.